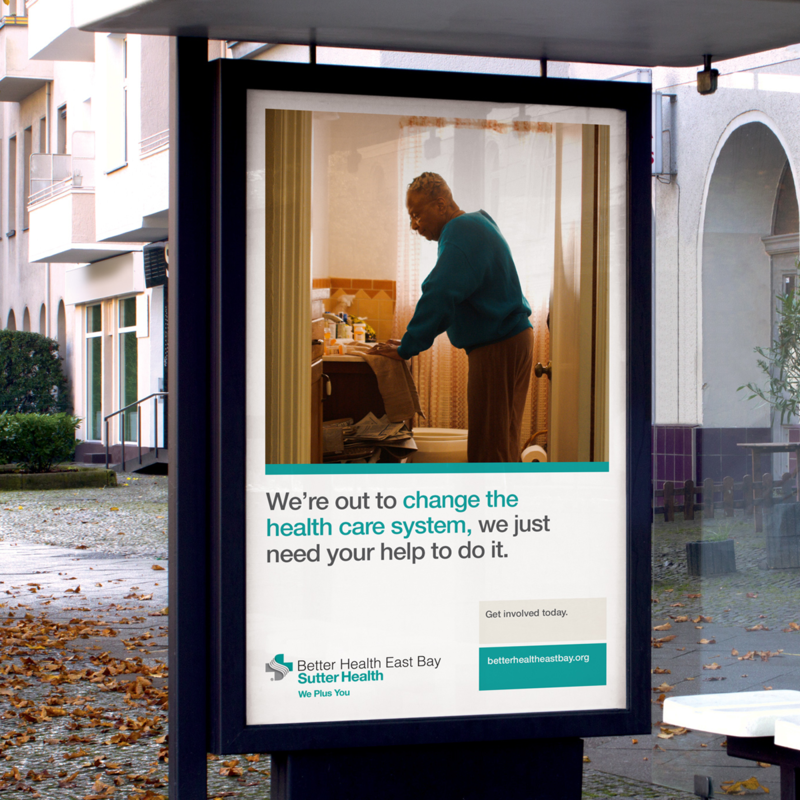 In 2014 Sutter Health, a not-for-profit health system in Northern California, combined three leading medical foundations in its Oakland, CA region into a new philanthropic entity called "Better Health East Bay.” Message was asked to launch this new brand to an audience with virtually zero brand awareness and create engagement with prospective partners that shared BHEB’s vision for transforming healthcare, particularly among underserved communities. In 2014 Sutter Health, a not-for-profit health system in Northern California, combined three leading medical foundations in its Oakland, CA region into a new philanthropic entity called "Better Health East Bay.” Formed to address critical changes to health care brought about by the Affordable Care Act, Better Health East Bay’s challenge was how to best serve the diverse communities of the East Bay. 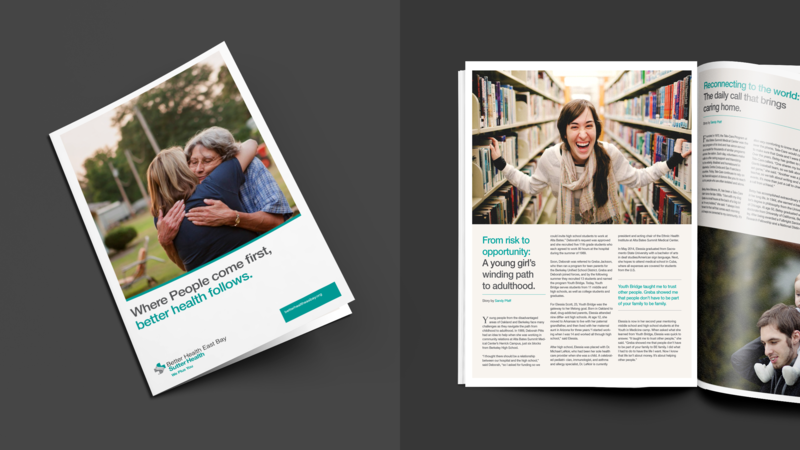 The challenge brought to Message was to launch this new brand to an audience with virtually zero brand awareness and create engagement with prospective partners that shared our client's vision for transforming healthcare, particularly among underserved communities. The Message rebranding effort focused on a simple idea: "Where people come first, better health follows." Based on research to identify a target audience of high-net worth, tech-savvy donor prospects, the campaign focused on providing new types of care for health care emergency room “super-utilizers”, and at-risk communities. As part of an integrated launch campaign, Message developed an initial "Anthem" spot to introduce viewers to this new philanthropic entity, re-imagined the existing website to make it more donor-friendly, and used cutting-edge advertising in the digital and social space to raise brand awareness. Additional video content detailed specific initiatives, with a highly sophisticated digital campaign targeted at the identified donor demographic. Better Health East Bay also sought to expand its database of supporters. Message established a presence on social media—where none existed before—and developed a content strategy focused on engaging an audience interested in cutting-edge technologies that serve the most vulnerable in our society. Message also made targeted native advertising and streaming media buys in publications like Venture Beat and on apps like Pandora. Finally, Message recognized the trend towards mobile content and developed mobile-optimized web, email, and data collection assets to drive engagement on tablet and mobile devices. Message has successfully refocused the Better Health East Bay brand from “place-based” to “purpose-based” giving. The advertising campaign generated millions of impressions and tens of thousands of unique web page and video views. The films generated a major increase in engagement levels online with 81% of viewers watching the video through completion, a figure significantly higher than industry norms, and the campaign was awarded Silver for “Video Campaign of the Year” at Modern Healthcare and Advertising Age’s Impact Awards. Message also generated an increase of over 2000% in social media followers and post engagement while identifying over 60,000 new email leads critical to generating interest in programs targeted at the underserved. Finally, in a survey of East Bay patients and potential donors, 47% said they were familiar with the brand when only a year prior it did not exist. 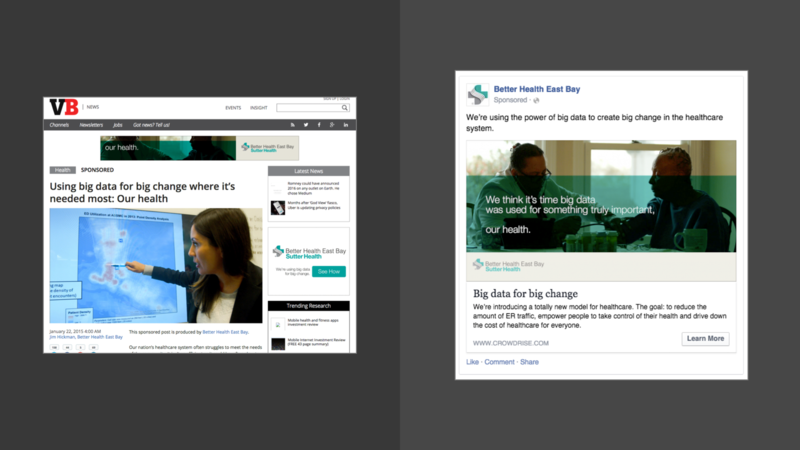 "In 2014 Sutter Health, a not-for-profit health system in Northern California, combined three leading medical foundations in its Oakland, CA region into a new philanthropic entity called "Better Health East Bay.” Message was asked to launch this new brand to an audience with virtually zero brand awareness and create engagement with prospective partners that shared BHEB’s vision for transforming healthcare, particularly among underserved communities." Better Health East Bay – Anthem from MessageLA on Vimeo.